Breckenridge is a pretty special place to live. From mountain views to the wonderful stores and restaurants run by members of the community, Breckenridge is well-loved for a variety of reasons. However, moving into this amazing home could certainly make your experience more enjoyable. 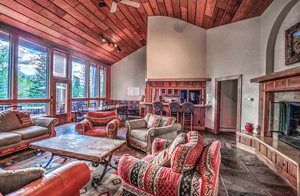 It has a variety of unique features and I think you’ll agree that it’s an obvious choice to be the featured MLS listing for Breckenridge this month. Let’s start with the size. It has six spacious bedrooms, giving you enough room for family and friends to visit. You’ll also enjoy an old fashioned Great Room that has dramatic vaulted ceilings. Then there’s an expansive game room. You can use this beautiful space any way you wish, from billiards to arcade games. The exterior offers plenty of room as well. Take advantage of the big, grassy lawn to host parties and let your guests take in gorgeous views of the Ten Mile Range. Plus, this fantastic home comes with an enormous deck and a brand new hot tub. Just imagine the fun gatherings you can have with such wonderful grounds! I can’t forget to mention the exquisite finishing touches in this majestic home. Have a look at the wood accents that provide a comfortable fell throughout each room without diminishing the house’s modern beauty. To complement this high quality wood, this home has dazzling countertops in the kitchen and the latest designs in tile flooring. The openness of the living and dining areas are also quite appealing. This floor plan charmingly contributes to the house’s vast feel. Also, you should know that the downstairs bathroom has been remodeled, too. I would consider this dream house to be one of the best in Breckenridge and if you’re in the market for a home, you should certainly tour this one. As a final, but significant detail, when you buy this terrific property, you’ll be within walking distance of downtown Breckenridge and the free bus system. This means you don’t have to travel far to experience the eclectic, locally owned shops and restaurants that have made this town such a beloved location. There is so much to share about this wonderful Breckenridge home and I’m happy to show it to you whenever you’re available. If you’d like to take a tour of this featured MLS listing, Give me a call and I’ll set up the ideal time for you to see the home and property yourself. Also, if you want to see other properties in Breckenridge or throughout Summit County, I’m happy to put together some MLS properties that might meet your needs. You’re always welcome to look through the updated listings on my website if you’re beginning your research, and when you’re ready to discuss your options or prepare for showings, contact me at any time via email ([email protected]) or on my office line. I look forward to working with you to find your perfect home.